Sports betting operator Sportium has been named Official Betting Partner of the Spanish Football League (LFP), the body that oversees the country's two professional football leagues Segunda and Liga DivisiÃ³ns, for the 2014/15 season. LFP has seemingly softened its historically negative stance on bookmaker sponsorships as Sportium replaces Finnish charity gambling firm PAF. Under the terms of the agreement Sportium has acquired extensive rights to branding in-stadia and on all fields, attained image rights of players and teams and a strong digital presence across LFP's mobile, social networks, television and live-streaming broadcasts for an undisclosed but presumed to be substantial consideration. Sportium has committed to fair play under the terms of the agreement and has undertaken to continue alerting league authorities on suspicious betting patterns and the like in the interests of integrity in sport. "The LFP has chosen Sportium as its official betting partner because both entities share fundamental values âEUR‹âEUR‹such as integrity of the competition and preventing fraud, an issue in which they will focus all their efforts and work together on," a joint statement said. 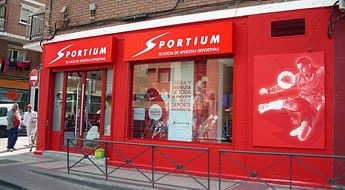 The LFP-Sportium partnership will be fronted by former national football coach JosÃ© Antonio Camacho.